The dramatic, larger-than-life true story behind the founding of Oculus and its quest for virtual reality, by the bestselling author of Console Wars. In The History of the Future , Harris once again deep-dives into a tech drama for the ages to expertly tell the larger-than-life true story of Oculus, the virtual reality company founded in 2012 that--less than two years later--would catch the attention of Mark Zuckerberg and wind up being bought by Facebook for over $2 billion dollars. This incredible underdog story begins with inventor Palmer Luckey, then just a nineteen-year-old dreamer, living alone in a camper trailer in Long Beach, California. At the time, virtual reality--long-hailed as the ultimate technology--was so costly and experimental that it was unattainable outside of a few research labs and military training facilities. 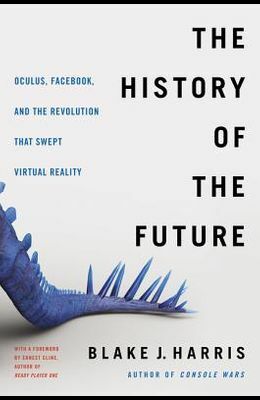 But with the founding of Oculus, and the belief that his tantalizing vision of the future could one day be more than science fiction, Luckey put everything he had into creating a device that would allow gamers like him to step into virtual worlds and, in doing so, hopefully kickstart a VR revolution. With the help of an industry legend, a serial entrepreneur, and a slew of colorful characters--including those behind gaming sensations like Doom, Words with Friends, and Guitar Hero--Luckey's scrappy startup would finally deliver the dream of immersive and affordable virtual reality to consumers, leading geeks and gamers to be excited in a way that they hadn't been in years, and tech firms and investors scrambling to get in on the action before it was too late. Over the course of three years (and with unprecedented access from Oculus and Facebook), Harris conducted hundreds of interviews with key players in the VR revolution--including Luckey, his partners, and their cult of dreamers--to weave together a rich, cinematic narrative that captures the breakthroughs, breakdowns, and human drama of trying to change the world. The result is a supremely accessible, entertaining look at the birth of a new multi-billion-dollar industry; one full of heroes, villains, and twists at every corner. Take, for instance, Harris' own discovery while writing this story. When he started this endeavor, he had no idea that this tale would somehow involve Donald Trump, billion-dollar lawsuits, illegal practices, and end with Luckey--eventually ousted from Facebook--as one of the most polarizing figures in Silicon Valley.